Festival kick-off reception. Photo provided by Samuel French. There are many theater festivals and conferences that select participants and winners carefully behind closed doors. Some of these programs have public performances, and some have readings only for theater insiders and participants after the selection has occurred. The Annual Samuel French Off Off Broadway Short Play Festival provides something different — a blend of private reading and ranking that continues into a public vetting stage with the prize of publication. With a bit of elimination round talent competition flavor, finalist playwrights from around the country bring a production of their play to New York City for juried performances that serve as the final stage of the selection process. Winners from recent years include Bekah Brunstetter and Sheila Callaghan (who won in 2007 and were published in 2008) and Daniel Perle (a winner in 2011 and published in 2012). This year’s crop of winners includes Kelly Younger, whose play Mandate will be published in the 39th series volume in 2015. From new voices to established professionals, everyone has a shot on this Festival stage. Months of preparation precede the jam-packed days of the 39th edition of the “OOB” (pronounce it affectionately, as the Sam French staff members do) five days of performances. This year’s eight “performance sessions” presented thirty semi-finalist contenders (selected from 1,380 submissions), two “finals sessions” and one “winners showcase” — the victory lap for this year’s six short plays that jumped all the hurdles. 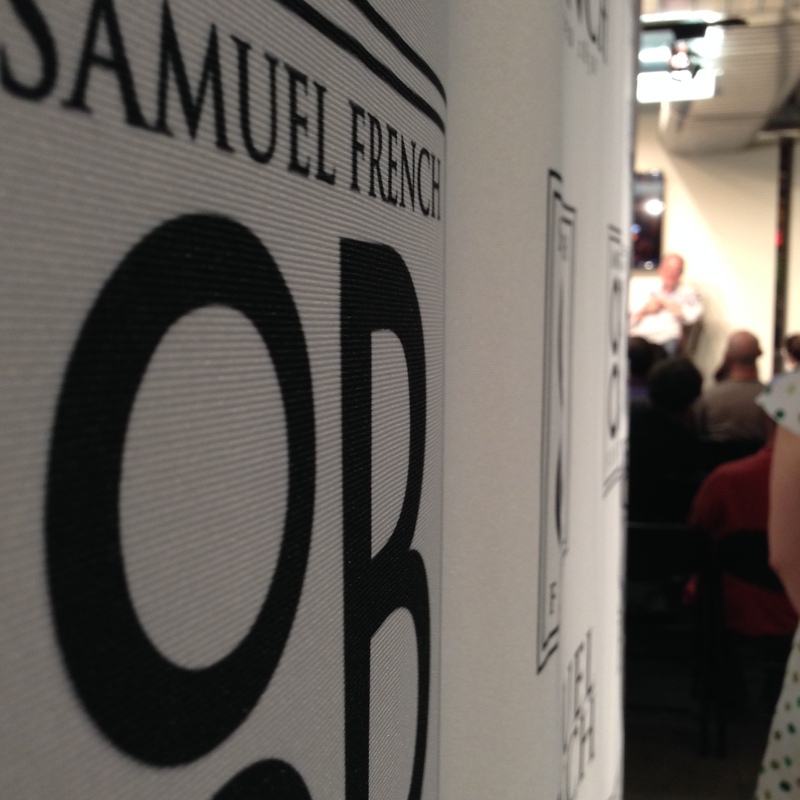 I attended two evenings of “performance sessions,” the one-day of “finals,” and the final deliberations among Samuel French staff to determine the six playwrights to be published in the Samuel French OOB Festival: Off Off Broadway Festival Plays 39th Series. I also spent several hours spread over several days with the Festival Co-Artistic Directors Amy Rose Marsh and Casey McLain, who work together at Samuel French — Marsh as Literary Manager and McLain as Operations Manager — and at Concrete Temple Theatre, where Marsh covers Outreach and Dramaturgy and McLain is Lighting Designer and Stage Manager. More people need to know about this fabulous tradition that even the organizers say isn’t for every playwright. The submissions begin in late December or early January each year, announced with a posting on the Sam French website. An organization (say a school or an acting studio) can submit up to fifteen short plays, and each individual playwright can submit up to three. The submission period ends in March; the in-house Festival staff takes over reading, processing, and assigning scores. Marsh utilizes much of the Samuel French staff, former interns, and dramaturgs she knows in this process. McLain reflects, “It’s literally us reading from January to May, in all of our off time.” Every submission is read at least twice, leading for some to a third read (this year 400) by a festival executive committee. The sixty plays that ended up in the final decision room were cut to thirty finalists that were curated as the four evening Festival competitions. This year eleven plays made the “finals sessions,” and six moved on to publication. For the first twenty years of the festival, Samuel French used contractors to produce the days of public performance, and took it in-house in 2008 when they realized that they had the internal capacity to produce. “We’ve been able to make it an efficient extension of our jobs,” Marsh remarked. Archiving the Festival process is important to Marsh, who references 13P, another self-producing playwright initiative that presented its final production in 2012), and built a robust archive of all thirteen plays produced during their tenure. The Festival’s web site includes a kind of 13P-like OOB process archive for the final thirty plays selected each year. One important thing that strikes the Festival visitor on any of the finalist competition evenings is that these events are much more than staged readings, and somewhat less than full productions. Which begs the question: What are rules? The playwrights are provided with an array of stock furniture and if they want to add to it, they have to obtain McLain’s permission. Samuel French is technically the producing organization, but the playwright is the stage manager contact for the show. They have to pay late fees or fines; they’re in charge of making sure they register their actors. But we provide the liability insurance that’s needed, and we make sure that it’s 99 seats, and we’re in compliance with the $18 tickets and all of that stuff. The question of which plays happen when on the four scheduled finalist nights is taken care of by McLain—the playwrights submit a form with production requirements and days of availability, and McLain curates accordingly, balancing technical needs, as well as genre, cast size, and flow of each performance session. Each night of the curated Festival shows has a variable number of plays that move on to the final Saturday sessions based on the opinions and consensus of each night’s guest trio of judges. The nightly varying judging team decide, with Samuel French staff input, which of the seven or eight plays proceed to Saturday’s “finals session” that is judged by Samuel French staff. The end result is a six winning plays that have an additional performance on Sunday in the “winners showcase” and are published in next edition of the annual series Off Off Broadway Festival Plays, usually released the following calendar year. Individual plays that make the final six will be performed three times, plays that reach the finals are performed twice, and the balance of plays are performed for the paying and invited audience only once. So much of the Festival is about a process, the page to kind of stage—it’s a competition that celebrates process. It’s a real play lover’s festival. We’re a company where our primary customer base is the play loving community. It’s a festival for people that embrace the high arts.